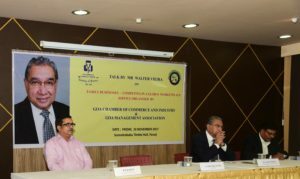 As part of GMA’s regular Knowledge Lecture series, a talk by Mr. Walter Vieira on Family Businesses – Competing in a Global Marketplace was organised by Goa Management Association, jointly with Goa Chamber of Commerce & Industry (GCCI) on 24th November 2017 between 6.00 pm to 7.30 pm. at GCCI Convention Hall, Panaji Goa. Mr. Walter Vieira, a well-known management consultant, management author, columnist, speaker and Former Chairman of the International Council of Management Consulting Institutes – the world apex body of Management consultants – outlined his observations about some of the aspects of family businesses and shared his experiences and experiments of many families. He spoke about the manner in which family businesses have adapted to the rigors of business management and managing their business, while keeping their personal family relationships stronger. He elucidated many examples of international and Indian business families, who have adopted family constitutions, aptitude based roles, distinction between roles as ownership and management, and many other ideas which are useful for emerging family businesses to emulate. The lively and interactive talk was interspersed with anecdotes and experiences, and was followed by a enthusiastic question and answer session. Earlier, Mr. Sandip Bhandari, President, GCCI, welcomed the gathering and introduced the speaker. Dr. Pradeep B Salgaonkar, Chairman, GMA, concluded the session by summing up the learnings and offering thanks to all concerned. The talk was attended by around 100 people from business, industry and professionals.